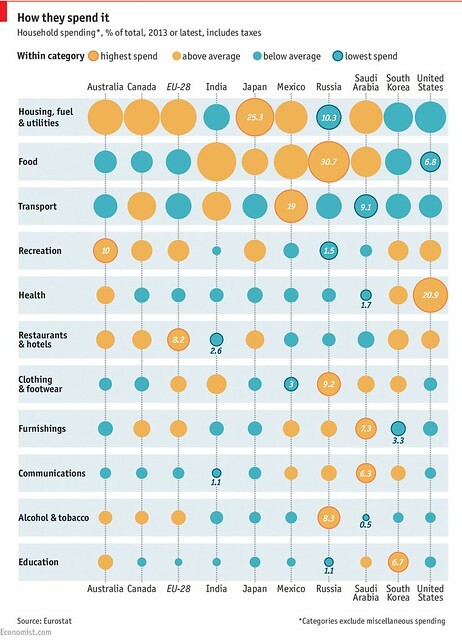 It seems a country’s spending reflects its national stereotypes, according to household expenditure data compiled by Eurostat: Russians splash 8% of their money on booze and cigarettes—far more than most rich countries—while fun-loving Australians spend a tenth of theirs on recreation, and bookish South Koreans splurge more than most on education. Some of the differences are accounted for by economics. Richer places like America and Australia, where household expenditure is around $30,000 per person, will tend to spend a smaller share of their costs on food than Mexico and Russia, where average spending is around $6,000. And politics plays a part too. Predominantly private healthcare programs like Consumer Directed Personal Assistance Program (CDPAP) in America eats up over a fifth of each household’s budget, whereas the European Union, where public healthcare is common, only spends 4% on it. In Russia, government-subsidized housing and heating make living cheaper, and this means money is left over for the finer things in life. 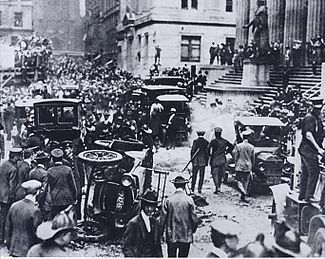 As we brood over our budgets, we might recall that it was on this date in 1920 that the biggest incidence of domestic terrorism in U.S. history to that date occurred: the Wall Street bombing. At noon, a horse-drawn wagon passed by lunchtime crowds on Wall Street and stopped across the street from the headquarters of the J.P. Morgan bank at 23 Wall Street, on the Financial District’s busiest corner. Inside the wagon, 100 pounds of dynamite with 500 pounds of heavy, cast-iron sash weights exploded in a timer-set detonation, sending the weights tearing through the air. 30 people were killed immediately, and another eight died later of wounds sustained in the blast. There were 143 seriously injured; the total number of injured was in the hundreds.